A heating device that burns either wood pellets or pellets made from other biofuels. A high-quality pellet stove offers an efficiency range of 75%-90%. 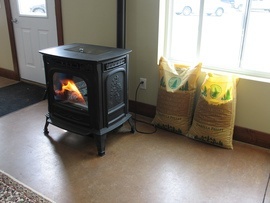 Pellet stoves are generally more economical than electricity and propane. They provide ambiance as well as warmth. A 40,000 BTU pellet stove is sufficient to heat a 2,000 square foot home. Pellet stoves run from $1,700 to $3,000, depending on the model and the BTU burn rate.